There is just something about a blush from BeneFit. The adorable packaging design, the clunky box container, the lovely scent of the product. Each BeneFit blush almost seems to have a personality. The box design evokes a feeling. My mood determines which BeneFit blush I might want to grab. Feeling natural or classic? Dandelion. Looking for the wow factor? Grab Bella Bamba. You get the idea. These blushes were designed to be worn and to be collected. So many blushes in my collection end up going out of use over time, collecting dust. Not my BeneFit blushes though. BeneFit blushes beg to be worn and loved. I *heart* all the blushes in my makeup collection reguardless of brand or price. But, all my blushes are not loved equally. Somehow my BeneFit blushes seem just a little bit more special. They just have that extra "something" that makes them stand out. I have mentioned many times before that I am a "blush girl". Somehow blush seems to "do it" for me more than almost any other type of makeup. Blush is my next-to last step when I am getting ready. It is the step that makes me go "ahh, now thats more like it! I'm ready!" So, when you combine my love of blush as a product with my love of the BeneFit brand with its cute packaging, lovely scented products, and great quality, you get one excited makeup shopper: Me! My latest BeneFit boxed blush acquisition? 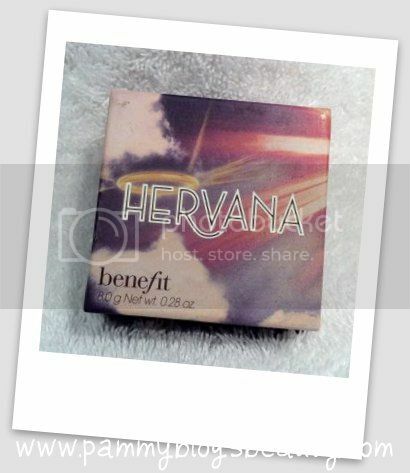 BeneFit Hervana! As you can imagine from reading the intro on this post, I was more than excited to get BeneFit's Hervana! Actually, I have been meaning to review this beauty for quite some time! As soon as I heard that BeneFit had a new matte blush, I knew that I just had to have it! People love BeneFit blushes. But, when I hear complaints about BeneFit's blushes, it is usually along the lines of "it's too sparkly". 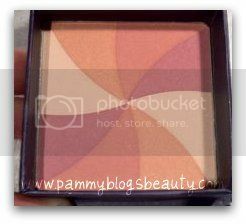 So, if you have steered clear of BeneFit's blushes because of the shimmer, then you might want to check out Hervana! 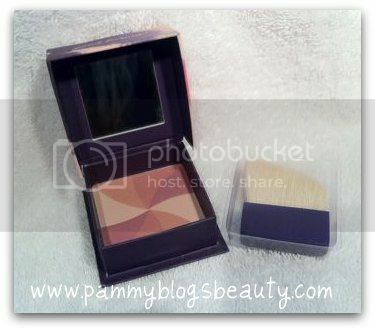 BeneFit labels this box as a "Good Karma" powder! I must say, agreed! It is almost impossible to tell what color this blush will be on your skin from looking at the pan. The colors in the pan are a swirl of shades: shell, peach, rose, and berry. Somehow these shades all mix together to create a beautiful and natural looking blush. Hervana wears as a pretty somewhat cool-toned pink on my very fair skin. The overall effect is very natural and pretty. There is some very slight shimmer in the pan; but, on the skin it wears matte. Not only do I love the packaging and shade of this product, I love the scent too! I literally take a big "whiff" every time I open the box. The scent is quite perfumey. I can't quite place it, but it does seem floral. While I use my own blush brush when I apply Hervana, the actual brush included is really pretty good. BeneFit's Hervana is destined to be worn, used up, and repurchased! I find this shade to be just perfect for Summer! BeneFit can be found at Sephora, Ulta, and of course BeneFit online! This blush retails for about $28.00. Any other BeneFit blush fanatics? Which ones are your favorites? I love the Benefit blushes, they make me so happy! I have Coralista, Sugarbomb and Bella Bamba, Bella Bamba being my favorite, the scent is so smile inducing! !